Why people who brainstorm are wasting their time. Brainstorming is often used in a business setting to encourage teams to come up with original ideas. It’s a freewheeling meeting format, in which the leader sets out the problem that needs to be solved. Participants then suggest ideas for solving the problem, and build on ideas suggested by others. A firm rule is that ideas must not be criticized — they can be completely wacky and way out. This frees people up to explore ideas creatively and break out of established thinking patterns. As well as generating some great solutions to specific problems, brainstorming can be a lot of fun. Osborn claimed significant success for his technique. As one example of brainstorming’s effectiveness, he cited a group of United States Treasury employees who came up with 103 ideas for selling savings bonds in forty minutes. Corporations and institutions including DuPont, IBM, and the United States government soon adopted brainstorming. By the end of the twentieth century, its origins forgotten, brainstorming had become a reflex approach to creating in many organizations and had entered the jargon of business as both a noun and a verb. It is now so common that few people question it. Everybody brainstorms; therefore, brainstorming is good. But does it work? Claims about the success of brainstorming rest on easily tested assumptions. One assumption is that groups produce more ideas than individuals. Researchers in Minnesota tested this with scientists and advertising executives from the 3M Company. Half the subjects worked in groups of four. The other half worked alone, and then their results were randomly combined as if they had worked in a group, with duplicate ideas counted only once. In every case, four people working individually generated between 30 to 40 percent more ideas than four people working in a group. Their results were of a higher quality, too: independent judges assessed the work and found that the individuals produced better ideas than the groups. Follow-up research tested whether larger groups performed any better. In one study, 168 people were either divided into teams of five, seven, or nine or asked to work individually. The research confirmed that working individually is more productive than working in groups. It also showed that productivity decreases as group size increases. The conclusion: “Group brainstorming, over a wide range of group sizes, inhibits rather than facilitates creative thinking.” The groups produced fewer and worse results because they were more likely to get fixated on one idea and because, despite all exhortations to the contrary, some members felt inhibited and refrained from full participation. Another assumption of brainstorming is that suspending judgment is better than assessing ideas as they appear. Researchers in Indiana tested this by asking groups of students to think of brand names for three different products. Half of the groups were told to refrain from criticism and half were told to criticize as they went along. Once again, independent judges assessed the quality of each idea. The groups that did not stop to criticize produced more ideas, but both groups produced the same number of good ideas. Deferring criticism added only bad ideas. Subsequent studies have reinforced this. Work alone. You’re going to be best able to design revolutionary products and features if you’re working on your own. Not on a committee. Not on a team. Ideas are like seeds: they are abundant, and most of them never grow into anything. Also, ideas are seldom original. Ask several independent groups to brainstorm on the same topic at the same time, and you will likely get many of the same ideas. This is not a limitation of brainstorming; it is true of all creation. Because everything arises from steps, not leaps, most things are invented in several places simultaneously when different people walk the same path, each unaware of the others. For example, four different people discovered sunspots independently in 1611; five people invented the steamboat between 1802 and 1807; six people conceived of the electric railroad between 1835 and 1850; and two people invented the silicon chip in 1957. When political scientists William Ogburn and Dorothy Thomas studied this phenomenon, they found 148 cases of big ideas coming to many people at the same time and concluded that their list would grow longer with more research. Having ideas is not the same thing as being creative. Creation is execution, not inspiration. Many people have ideas; few take the steps to make the thing they imagine. 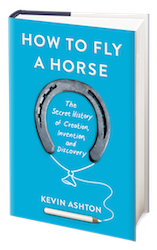 Excerpted from How to Fly a Horse: The Secret History of Creation, Invention, and Discovery, by Kevin Ashton, available here.